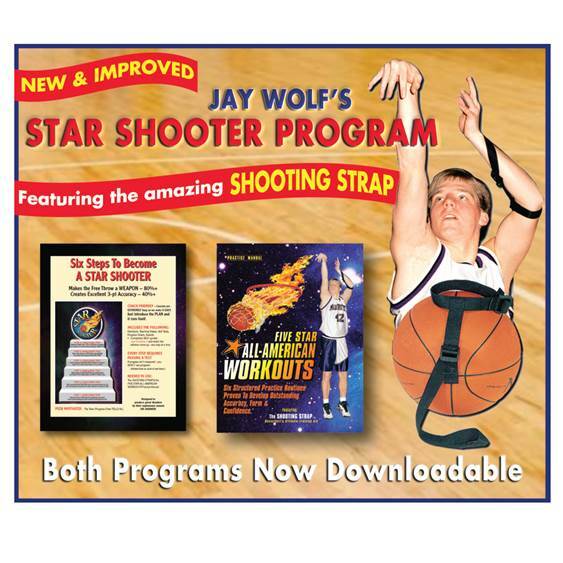 You’ll SCORE MORE with Jay Wolf’s NEW Star Shooter Program. Drastic scoring improvement for ALL skill levels is GUARANTEED because of Jay’s unique practice strategies and his famous SHOOTING STRAP training aid that speeds learning. Six Steps To Become a STAR SHOOTER first refines technique and perfects the Free Throw – 80%+ in games. Then his Five Star All-American Workouts develop accuracy from all over the court – 3’s at 40%+. In the end, you’ll SCORE with CONFIDENCE – from a pass and off the dribble – when you use Jay’s Star Shooter Program.